26-year-old Abdul Bajandar from southern Bangladesh suffers from epidermodysplasia verruciformis, a condition so rare there are only three known cases in the world. 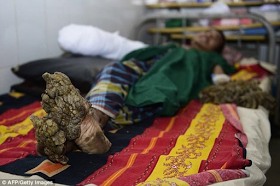 The condition is dubbed 'Tree Man' because sufferers grow bark-like warts on their appendages. 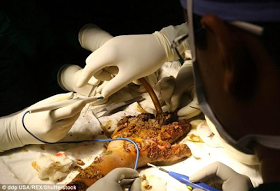 He successfully underwent surgery to remove the warts that first started to appear ten years ago from one of his hands. 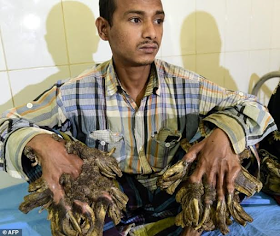 It took a team of nine doctors at the Dhaka Medical College Hospital, to remove the growths from just one of his hands. Bajandar's condition made him a celebrity of sorts with people travelling from all over to see the 'Tree Man' and many more visiting him in hospital. He was given the all-clear for surgery after tests confirmed the warts were not cancerous. The Bangladesh government agreed to bear the costs of his treatment and Prime Minister Sheikh Hasina was given an update on his condition, Sen said. Bajandar's wife Halima Khatun saw her husband after the operation and said he looked 'relaxed and happy'. Mr Bajandar said he initially thought that the warts were harmless but slowly as the growths covered his hands and feet, he was forced to quit working as a bicycle rickshaw puller.